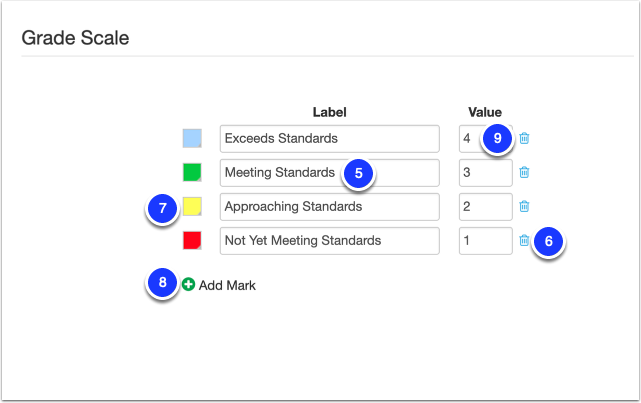 This lesson will show you how to create a new Standards-Based Gradebook (e.g., for a particular section/period/class of students and/or subject area) in Illuminate. If you will be using GradeBooks scores for Report Cards, make sure to check with your district for calculations used on the Report Cards. 3. 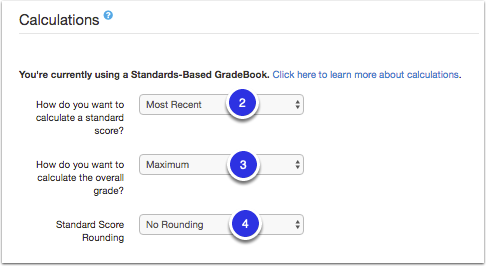 Select the type of Gradebook you wish to create, in this case Standards Based. You will create multiple gradebooks for each period or subject you report out on in your report card. You will repeat this process for as many gradebooks you need. If you are planning to push the gradebook grades to report cards, it is important that your gradebooks match the subjects in your report card. Give the GradeBook a name. Typically Gradebook Titles match that of a report card such as Reading or English Language Arts. For Secondary, it could be titled Period 1 Geometry or 03 Economics. Standard Calculation Score: How do you want to calculate a standard score? This is the overall score given to the student for assignments aligned to the same standard. For example: The student has been given marks for three assignments aligned to standard LA.1.1. Let's say he/she receives a 1, 2, and 3. If the user selects "Maximum Value" for the overall standard score then the student would receive a 3. Decaying Average (75% newest): The standard score will equal the average of all the scores linked to a standard but weighs the most recent score at 75%.\L\L Why use a decaying average? Because a decaying average rewards learning. Traditional averaging punishes students for not mastering a standard right away. Low scores at the beginning of a grading period will hold the average down, even if students master the standard by the end of the grading period. A decaying average weighs the most recent score the most, allows students to learn from their mistakes, and rewards students for learning. If a student starts off with high scores that later drop significantly, a decaying average will alert students, parents, and teachers to a potential problem much more quickly. Perhaps the assessments weren't valid, or the student was cheating, or there’s something going on outside of school? If a low score is a one-time fluke, the student’s score will recover quickly. Mean (Average): The standard score will equal the average of all scores in the GradeBook linked to any given standard. Power Law: This is a calculation based off of Marzano's work with standards-based grading. In essence, the power law formula predicts what the student’s next score will be based on scores already present. In my example you'll notice the scores show continuous improvement, which impacts his/her standard score. The selections made above are traditionally in similar notion to your Organization's grading practices. Overall Grade Calculations: How to you want to calculate the overall grade? This is the score given to the student based on his/her performance across multiple standards. Let's extend the example above and say that in addition to the three assignments aligned to LA.1.1 the student has received three additional scores aligned to MA.1.1 (again using the maximum value). Pretend the student received a 1, 1, and 1 this time, so his/her standard score would be a 1. So...if the user selects "Minimum Value" for the overall GradeBook score then the student's grade would be a 1 in the instance. Standard Score Rounding: Do you want to round the overall grade score? This will default to No Rounding, but you can chose to Round Up or Round Down. Round Up means the value will round to the higher level (i.e. 3.12 or 3.76 will both round up to 4). Round Down means the value will round down (i.e. 3.12 or 3.76 will be a 3). You can change the Label by deleting what is in the box and typing in what you like. You can delete a band by clicking on the trash can. You can change the color of the band by clicking the color square to the left of it. You can + Add Mark, and it will add to the top of the scale. You can change the value by clicking in the Value box. The Grade Scale can be set up using decimals to the hundredths decimal place, i.e. Through Understanding- 2.50, Adequate Understanding- 2.00, etc. This is where you choose your students, typically By Class or section tied to rosters and master scheduling. Should I Add Students Manually? Select Save to save the Gradebook and send you directly into the GradeBook to get started. In the event that you need to remove the GradeBook, select Delete GradeBook. Select Cancel to not save the Gradebook and go back. After the gradebooks are created to mirror your report card, you might want to begin learning more about Assignments and Scoring. 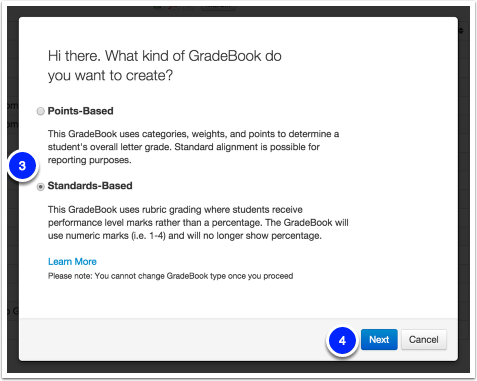 For additional resources on Gradebooks, visit U410 Getting Started with Gradebook.